The Aldersgate choir is led by the musical team of Music Director Kay Marshall and Organist Robert Marshall. During worship services the choir leads the congregation in singing of hymns and responses, and presents an anthem each week. In addition the choir presents seasonal cantatas at Christmas and Easter. All who wish to contribute to the music program of the church are welcome and encouraged to join the choir. Auditions are not required! The UM women meet monthly. Visit the Calendar page for date and time. The UM Men of Aldersgate UMC and Central UMC meet jointly during the period of September - May. Dinner meetings alternate monthly between AUMC and CUMC social halls at 6:30 PM on the second Wednesday evening of the month. A devotional, business meeting, and special program follow the meal. AUMC Men sponsor a separate Children's Christmas party in December with a meal, reading of the Christmas story, singing carols, and a visit from Santa Claus with a gift for every child. Aldersgate UMM and Central UMM each sponsor separate Sweetheart Banquets in February to honor their church ladies. Aldersgate's Banquet is scheduled annually for the Friday evening nearest Valentine's Day in February. An excellent dinner is followed by an humorous skit to present the Sweetheart of the Year to the crowd. The evening's entertainment is presented by semi-professional outside music and entertainment groups. Monthly fund raising dinners are sponsored by Aldersgate UMM to support Virginia United Methodist Commission on Disabilities (C.O.D.) programs, including Heart Havens and Camp Rainbow projects. These C.O.D dinners are held at 6:30 PM in the church social hall as announced. A semi-pot-luck format is followed wherein the UM Men furnish meat, bread, and drinks. Attendees bring a non-meat covered dish (vegetables, salads, desserts). A free-will offering is taken to support C.O.D. The dinner is usually followed by a group hymn sing. A home-made ice cream social is sponsored on the last Sunday of August. Come out to enjoy superb home made ice cream and other deserts, and great fellowship. 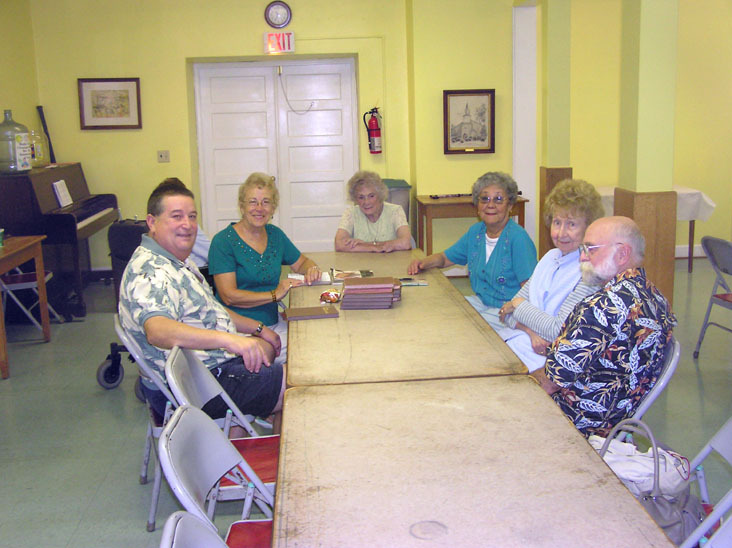 The Aldersgate UM Men participate actively in the York River District United Methodist Men's programs. We attend quarterly District UMM dinner meetings i held at various UM churches on the District. These meetings include a catered meal, a devotional, prayer concerns, District business and a program. The District UMM are currently sponsoring maintenance of the new Morrison Heart Havens home property located on Harpersville Road in Newport News. Officers for 2016 were elected at the November 2015 meeting. The Aldersgate Breakfast Club meets at 8:30 AM on the first Wednesday of each month in the Social Hall. Breakfast is prepared by a dedicated group of volunteers, including eggs, bacon, sausage, cooked apples, waffles, biscuits, and beverages. Everyone is welcome, including non-member friends of Aldersgate Church. Breakfast is followed by a group hymn sing. Led by President Grace Hall. Monday and Tuesday from 11:00 AM to 12:30 PM. Please check the calendar for updated dates and times.